Mark Wahlberg, Lauren Cohan, & Ronda Rousey Premiere ‘Mile 22’ in LA. 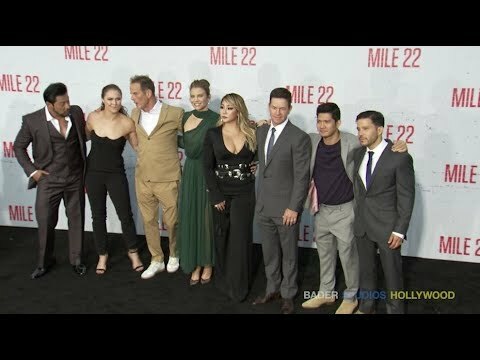 August 2018 – Hollywood, CA – Bader Content Studios went bend the scenes and talked with the cast of the action thriller Mile 22 – Mark Wahlberg, Lauren Cohan, and Ronda Rousey teamed up to premiere their new movie and were joined by their cast mates Sam Medina, Peter Berg, CL, Iko Uwais, Carlo Alban, and Nikolai Nikolaeff. Ski racer Lindsey Vonn and her boyfriend, Nashville Predators NHL star P.K. Subban, also stepped out to show their support for the CIA themed movie. In Mile 22, an elite American intelligence officer, aided by a top-secret tactical command unit, tries to smuggle a mysterious police officer with sensitive information out of the country. The film was directed by Peter Berg with the US and China has the main viewer focus.